Wow! Did anyone else notice how HEAVY this box was???? It made me very excited! One thing that I have to say about Glossybox is that, despite their rough start, they are making up some really good ground. I've always loved their packaging - their boxes are such great quality and the ribbon is a nice rusty rose grosgrain. It may not be customized like Luxebox, but I can overlook that. I've never tried Aveeno face products, other than the under eye roller ball, so this will be interesting. Everyone I've talked to say that they use this and love it. It does have SPF 15 in it, which makes me very weary. I find that products with SPF in it make me very greasy, has an unappetizing smell and I just don't like the feel of it on my skin. This one seems no differently in the smell department, but my skin seems to absorb it right away, so it looks promising. I can't believe I received a full size of this product!!!! Of course the first thing I did was smell it. UGH! It was very strong and not natural smelling. Coupled by the fact that I don't like shower gels...this was not a win for me. Apricot just seems like just a strange scent to be sending out to people. You would have thought they'd pick a more common scent like Vanilla or even Strawberries. This product is meant for colour treated hair, but I don't have colour treated hair. It's okay though, I'll use it - because it smells FAN-TAS-TIC! Plus, I really like Wella products. I think that this is supposed to be a hair mask? It doesn't really say on the product, in the description card or the Wella pamphlet that was included. I don't have the patience for hair masks, but since this one smells so awesome, I'll just *have* to use it! This mascara is supposed to define, separate your lashes while minimizing clumps and creating maximum lengthening potential for a lash-extension look without the extensions. I've never really used Marcelle products before, but since I'm so picky about mascaras, i might just give this one away and not waste it. Also included was a small packet of Marcelle BB Cream. I'm not even going to include this in value of the box because it's so small. I'll probably try this out, but I'm not sure if I'm going to like it - BB creams and I have a very love-hate relationship. And besides, this small packet will most likely be a one time use anyways. Total Value of box: $59.49. Box Rating : 4 out of 5. YAY for so many full sized items! Despite the fact that I'm going to be giving away the mascara and probably the shower gel, I'm really excited to try out the face moisturizer and the hair products...and if I did use shower gel, I would have been happy to receive the Elizabeth Grant shower gel. What did you think of April's GlossyBox? Great to hear you are enjoying your Glossybox subscription. I've has such a HORRID time with min in Australia. The stuff they send is just trash that i could get for free at the department store... Tiny little sample sachets and etc. So frustrating. The packaging is amazing though, I agree. Hi, thanks for the follow. Your blog looks pretty good, followed back =D! your GlossyBox looks very good. 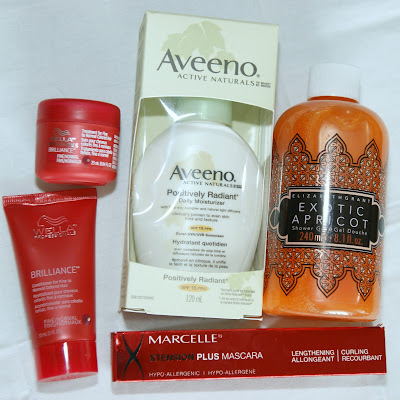 Looking forward to read your review about the Aveno facial moisturizer. I am in the market for a new facial cream. Thanks for the follow :) I think I will really enjoy follow your blog, gaming and beauty..2 of my favorite things right now! Oh, and I think it's great that you receive the Canada Glossy Box. This will be great for me to see comparisons. US Glossy Boxes are starting this month. Hi! I can't wait to see the comparisons between the two boxes either! I hope you enjoy the Aveeno moisturizer! It was pretty nice to get a such a good size of it too! See you on Steam! I want a box!! Seriously! They are just now getting a Glossybox here in the US. They shipped some out for reviews but aren't taking people to sign up just yet. I don't know if i'll sign up right away though. The first box looks great but we'll see how it is in a couple of months, esp if i'm going to pay $21 I better get some good stuff. Your box looks great though and hopefully they continue to be like that. I am going to have to check out glossybox, you have received some great products! Thanks for the review! Thanks! I just can't believe how many FULL SIZED products I got! yes, the US glossybox is mad expensive! 21 bucks a month! I wonder why they jacked the price so much? I feel lucky with our $15/month box now haha. I know it's crazy expensive! But check out Bravoe Runway's review of the press box. It's crazy awesome! So if the regular boxes are like that, then it may well be worth the $21? Have you gotten the Cinco De Mayo mystery box yet? I'm still waiting on mine. ARGH! It is awesome, we just got Glossybox in the US and I did a post on it last week! You got a great assortment of items, I love aveeno. I can't wait to see your review on your first GlossyBox! Thanks for following, I followed you back!